This is me, Rev. Robb McCoy outside my church in Moline, Il. I am The Fat Pastor. I am certainly not the only overweight clergy, but I was the first to pick this blog title. Why do I call myself the Fat Pastor? You can read my reason here. Even though I’ve gone through quite a transformation, I will continue to call myself the Fat Pastor. Here you can read why. I am writing this blog to share my journey to live well and do good in the world. 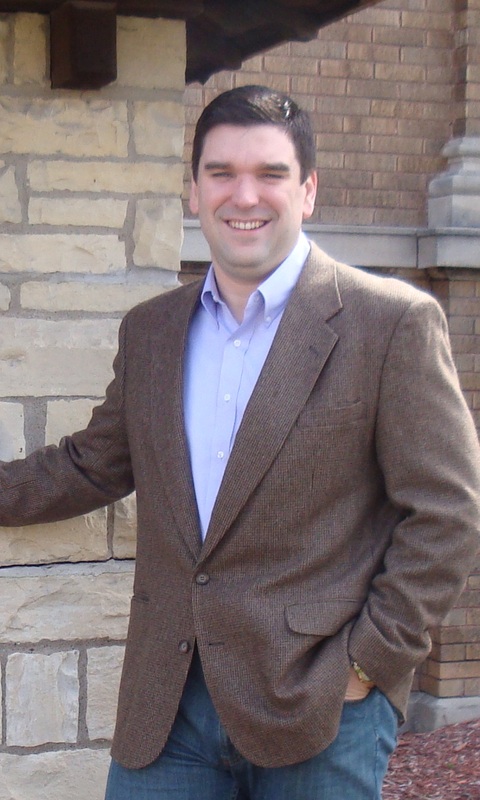 I am the pastor of Two Rivers United Methodist Church in Rock Island, Illinois, and a 2006 graduate of Eden Theological Seminary. I was ordained as an Elder in full connection with the Illinois Great Rivers Conference of the United Methodist Church in 2010. I graduated from Illinois Wesleyan University in 1999, where I met my wife. I love God and I love the three girls in my life. The rest is just details. I’ve Rejected that god too. 11 Ways to Be Christ in Christmas. I think your first entry is great. I also look forward to your entries and watching both of transform into healthier people. Dieting is simple, burn more calories than you take in. Keep your hands away from your mouth. Robb, I will look more in depth later, but I am fascinated by your blog here. My son, Kristofer, is also a graduate of Eden, perhaps you know him. I am a “Fat Old Pastor”, currently appointed to the Living Faith UMC in Tama and Montour, Iowa, a fascinating place to live and work. The “old timers” in the community are of Chech heritage. We also have the Sac and Fox tribe of native Americans who operate the state’s largest casino four miles to the west, as well as 12 – 15% Hispanic population and a smattering of black and Asian folk. I look forward to exploring your site and hearing from you in the future. I was so glad to find your blog. I’m currently being very intentional about my food intake. As a clergy member in a Methodist/Presbyterian church, I see more and more that Jesus said, “Feed my Sheep” not “Feed your Face” 🙂 I’ve found many programs for those of us who are more hungry for food than others. Compulsive Eaters Anonymous (ceahow.org) has a wonderful program of recovery that is 12 Steps, very focussed on spiritual connection. It has been my most effective program of successful, surrendered weight loss. In addition, our church has offered the Food and Faith curriculum from PCUSA… Practicing Our Faith at the Table. I see that you are incorporating exercise, but I have experienced that I must submit my food plan to an accountability friend or sponsor each day, then pray like heck and maintain my daily spiritual condition so my ‘resolve’ doesn’t disappear by 3pm. You are young and able to be such a mentor to pastors and people about how God wants us to be generous, not gluttonous, … When Jesus taught, “it would be easier for a camel to go through the eye of a needle..” was he only referring to our monetary lives? When we eat more than our share, we are taking food away from people who can’t even feed their hungry children. There you have my two cents. Most of all, you have my applause and appreciation!! Would like to link to the UMR article about you but need a copy of your football photo. Please let me know if you can share one with us at http://www.umc.org. Why is it going to be a “long road?” Just put down the fork you gluttonous sinner! Pastor Rob, I just recieved our letter from Riverside UMC that you will be joining us in Moline. Welcome. I will begin praying for you and your family for an easy, welcoming transition. I will also hold your current congregation in prayer. Welcome!!! Stress is one of the major causes of weight gain. Find healthy options and fun, active things to do with your family and you will see changes over time. People can be very mean and judgemental. Oh, I see you do! Thanks for the advice, and I do monitor the comments. I just figure small people need a voice too. They don’t bother me. I know who I am. I know my struggle. The scripture says, “delight yourself in the fatness of the Lord” but we both know that proper Hermeneutics is not the case here… I have a great friend tell me the best way to lose weight is don’t eat anything White, except chicken, and no sweets at all. I did that and lost 80 lbs in a year. Brand new to your blog (I found you through The Christian Left’s Facebook page, who linked to your “Happy Holidays” post). I predict you’re going to get a LOT more traffic here! I’ve struggled with my weight since I was about 11 years old, reaching and maintaining a normal weight twice in the last 50 years. My weight rules my life, and I’ve been blogging about it for years. I just love (snort!) the advice some of your readers have left for you … I love more your attitude about them. You seem like a really good man. I’ll be following your progress and, hopefully, soaking up some inspiration. Thanks. Robb, I just found your blog through a pastor friend of mine in Oklahoma. Love what I’ve read so far. I too am a chubby clergy in the Tulsa area and I blog on WordPress. Just read your comments on ‘Happy Holidays’ – truly thoughtful & succinct – and even humorous – I’m saving it. you are a beautiful writer with a powerful positive message. so happy to have been introduced to your blog. Many thanks for the mentions and new visitors to RethinkChurch.org – come write for us, too! Do good and well, young sir. Thank you for blogging an entertaining rant or two. Paster Rob, I am a United Methodist Church Church member, and have passed on your great poster web site and Facebook page to my Paster. He is also a big man, and is trying to lose weight. I am glad you are doing this, for it can be scary to put ourselves out there, especially those that are Pastors and Priest, and get the kind of finger pointing that a couple of these comments show. I also do not like when many people start going around and judging others, but what phrase they use, Happy Holidays or Merry Christmas. WHat do not understand, is many of these people do not even go to church? I have said that it is our actions that matter more that a petty phrase, and I am glad to see a Paster back me up. LOL I to came here because of your poster shared by a Facebook page, and I have shared it as well, and others have shared it and so on, so hopefully you will get your wish. I noticed on FB your story of another pastor that recently had the same form of WLS that I had three years ago…and it sounded like you may be looking into it just the same. I have to say, it was and is the best thing I have ever done (besides accepting Christ, of course) in my life. I have lost 200 pounds and would like to lose another 80 or so…but if not, I am happy that my life has changed so drastically. I’ll be honest, at not quite the highest point of my weight I was pushed out of the methodist church by a pastor that felt someone as “large” as I was should not work with the youth group–that I was a poor example to teen age girls. It took me losing quite a bit before i was able to find another church…i say this to tell you, this journey will only be about losing weight. People, sadly, will treat you differently. People will say things not only before but after you’ve lost weight that wound and have no remorse or comprehension of the pain they cause. This journey will not always be easy and again not just the weight loss portion — but i can promise you, it will be well worth it! Misty is so true in what she says. I too am a former United Methodist Local Pastor with 14 years experience. I am overweight and have been for quite some time. For some one to say,”just put down the fork,” tells me they do not understand what it means to struggle daily with this. In Oct 2008 I was let go by our Bishop and one of the reasons was my weight. He said I sat a bad example, among other things. He was not Christ like. I have moved to another denomination and now am ordained and serving a church. But the pain of that Bishop haunts me to this day. Robb, our youth group just returned from a mission trip to the Quad Cities through Youth Works. They had a great time and did some really good work. I just noticed you are in Moline…Small World! God instructs us to maintain a healthy body. Obese bodies are unhealthy and the cause of many diseases and undesirable conditions. More than 90% of fat people are fat, not because they have bad genes, suffer from stress or other medical conditions. They are fat pure and simple because they eat too much. It is an obscene and flagrant contempt of God’s holy will and divine command. We all struggle with “somethin'”–it’s no reflection on our Faith, our heart, our great big God. Walkin’ in His grace is the best way I’ve found to be transformed from glory to glory. Perfectionism wasn’t workin’ for me, but perseverance sounds pretty do-able. God bless you. I’m writing to invite you to join the new Bible Gateway Blogger Grid (BG²). If you’d like details, please email me. Thanks. Thanks for the invitation. I am very intrigued. I just replied. Isn’t it interesting that people feel free to judge someone who is overweight as being out of control and a “sinner,” and yet they feel very free to speak hatefully (note Jesus’ command to love your neighbor as yourself). So you who are without sin, cast the second stone, because you have already cast the first one. Praying for you, Rob, as you allow the Holy Spirit to continue the work God has started in you. Robb, I simply want to thank you for an extract I found in Synthesis (a publication geared to Episcopalians) in the issue for Sep. 18, 2016. I used it yesterday in my sermon based on that horrid reading from Luke that was the Gospel. “It doesn’t make sense …” was a repeated mantra in your piece and I found it effective. Thank you! Btw, I could have ended up in Davenport at one time, but glad I didn’t. The then-Dean of the Cathedral would’ve been difficult for me to work with! He later became the Bishop of Quincy (Episcopal) which doesn’t exist any more, having been ceded to the Diocese of Chicago. As you know our Church has experienced lots of “schism” recently, mainly over Bishop Gene, but I think we’re on a more or less even keel now. I’m retired, but still care. You’re lucky to be in that area with Peter Marty inspiring you, too! Bishop Chris Epting, one-time Bishop of Iowa, admired him greatly, too, as do I. And good luck inspiring us overweight people to get healthy. At 175 lbs (but 5′ 5″ and portly) and aged 75, I’m OK, but could stand to lose 10-15 pounds and not miss them. Ora pro me! Wow… I just read your 2014 post on serving communion to children. Very interesting. Oh and About Me, thats just great. Who says fat cant be Fit? Most people are just hypocrites.! Pastor serve God and serve the congregation you are in charge of then leave the rest for Him to decide. In fact, who says they have the right to even judge another? Oakland Baptist Church in Rock Hill, SC is using your Mother’s Day litany this week.